Thimbleweed is a graceful, interesting native Ozark plant that grows along forest edges (also native to many other areas of the eastern United States). It is most often found in the dappled shade of liminal spaces between forest and clearing. Before sending up flower stalks, the plant is only about a foot tall. The long slender flower stalks add an extra foot or two in total height. The stalks sway in the breezes, giving it one of its other common names, “windflower”. During the heat of July while out scouting for rocks – yes, rocks. I scout for plants, habitats AND rocks regularly. Anyway, I spied the bristly elongated cones of Thimbleweed. Of course I had to zip back up to the house because I generally don’t carry along the camera while dealing with rocks. Once the petals fall, the cone resembles a thimble, which is how the plant gets its common name. Last year in late January I noticed the seed fluff getting ready to take flight. Of course I gathered some of the seedheads. In the course of my gathering, many were naturally released onto the breeze to reseed elsewhere, so no danger of over harvesting seeds from this one. Thimbleweed is another one of my favorite plants (I have quite a few “favorites”, haha) of the Ozarks. I didn’t get the seeds I’d gathered sown this spring but I’ll try again next year. If successful, I’ll have some of these graceful beauties to offer at the market booth and nursery. Here’s a few links to pages with more information about Thimbleweed. It has a history of medicinal use, but I’d enjoy this plant just because of its unique appearance. It stands out in a crowds of weedy growth and I like that about it. That’s what I’m trying to do as a writer and blogger in a sea of other writers and bloggers, so we have something in common. It’s a plant that should be easy enough to propagate, so hopefully it will also one day grace the “Plants” category in our online store. I should be able to begin offering plants by mail in a few months. Here’s one of my monthly newsletters that goes out to my subscribers. This one is from May 2015 and is all about challenges, new discoveries, and a brand new product from Wild Ozark. Are you often faced with challenging situations to figure yourself out of? It seems I get to encounter “greatest” challenges often. Sometimes they’re tech related, as when I’m trying to learn how to do something new to or correct a problem with my website. Sometimes the challenges are physical, like when my body thought it could go no longer while we were working on fences here around the homestead. For the past week and a half, my new challenge has been Mother Nature. Specifically, it was the wind at the farmer’s market. Today (I’m writing this on Saturday 4/25) the wind was especially brutal. Signs kept blowing over, plants were toppled off of the shelves, and it was blowing from the beginning. I didn’t even bother to put up the television that runs the DVD in my booth. The booth itself tried to blow away (but thankfully that was tied to the truck, and a kind customer held onto one of the legs for me). My business cards have probably traveled on the wind all the way to Newton county by end of day. I had to close up shop early. Even with the distraction of the wind, the booth is at least a “storefront” and I’ve been enjoying talking to people who come in about ginseng and the habitat where it grows. If you’re in town (Huntsville, AR) on a Tuesday or Saturday morning, swing through the town square and say hello! What’s for sale at the booth? Well, not ginseng anymore. I’ve already sold out of all I had. Remember how I’d said my seeds didn’t sprout? More about that, below. What I do have is elderberry, wild strawberry, wild red raspberry, spicebush, pawpaw trees, witch hazel trees, gooseberries, and a few other things. I still bring some bloodroot, goldenseal, wild ginger, and blue cohosh. Once the doll’s eyes and black cohosh blooms, I’ll bring that too. I didn’t label the pots last year, so I’m waiting for blooms to be absolutely certain which is which. I’ll share my poor planning so you can avoid doing the same thing – I didn’t plant while the weather was still good, and then it started snowing and freezing and by then I didn’t want to go outside much, let alone try to rake leaf litter off of frozen ground. And then once it warmed up again, well, that’s when the rains started. So it was a major oversight on my part and it won’t happen again if I can help it. If for some reason I do have to hold them longer, I’ll have to give OzarkMountainGinseng.com a call to help me with the proper way to do it. I know it involves a bucket of damp sand in a cool, dark place. But better yet that I not procrastinate again. Now that the tender woodland herbs are done blooming and would fare poorly in the heat, I’m bringing more of the medicinal and edible plants like yarrow, All-heal, elderberry and some of the shrubs like spicebush and gooseberry. Sleuthing the Bellwort. Sessilifolia or Perfoliata? Does Ginseng Stewardship Benefit the Landowner? 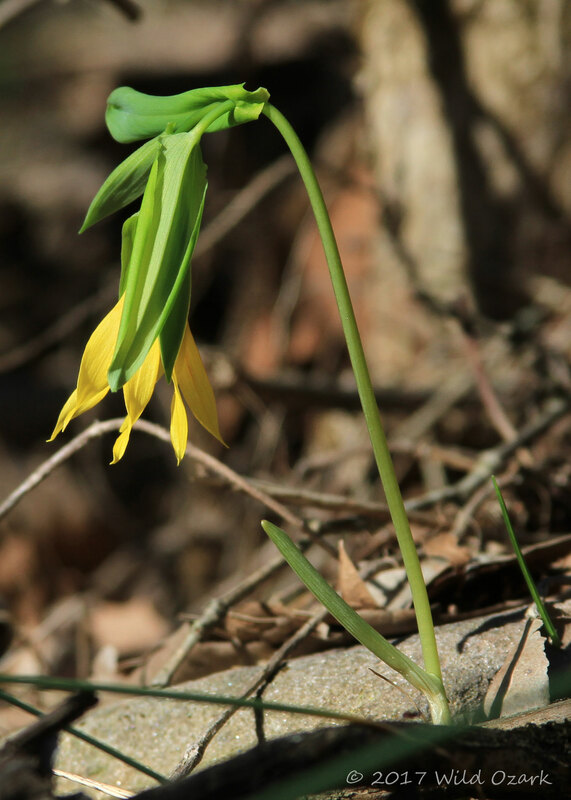 Three species of bellwort are found in Arkansas: Uvularia grandiflora, U. sessilifolia, and U. perfoliata. The one I see most often around here is the grandiflora, or Large-flowered bellwort as it’s commonly called. Bellwort often grows in the ginseng habitat, which makes it one of the ginseng companion plants, but it can tolerate more sun and is sometimes found in places ginseng won’t grow. It likes at least light shade and rich, moist soil with lots of rotted leaf debris. It is the combination of deep shade, moist soil, and nice layer of rotted leaf debris that gives the ginseng habitat its unique characteristics. There’s a spot along our county road that is sometimes sprayed with herbicides. The first time this happened, I mourned the loss of a large wild raspberry bramble I used to visit often when it fruited. Had I known it would get sprayed, I would have transplanted many of the plants that live there, including the raspberries. That raspberry is the only red raspberry bramble I know of in our area, although the plant itself is supposed to be fairly common in the Ozarks. The entire 500 yard stretch is home to so many of the various woodland plants I love to watch. The little ecosystem is regaining health now and even some of the raspberries have returned, but soon it’ll be in danger of elimination again because of that robust growth. This year I noticed a colony of small bellworts blooming and decided I’d move some of them in case the spray happened again this year. I knew they were bellworts, but wasn’t sure of the species. I’d never seen these kinds before. They weren’t the usual yellow bellworts I normally see. When I got back to the house I potted some of them up for the nursery and planted some in the habitat near the nursery. Then I set about making a proper identification. According to my copy of the Atlas of Vascular Plants of Arkansas, it would probably be Uvularia sessilifolia, since the perfoliata isn’t known to be in our county. However, I’ve found other plants not known to be in our county, so that didn’t necessarily help. Hmmm. With no pictures in the book to give a clue, I wondered about those last names. What did they mean? The latin words used in scientific names are usually full of visual clues if you know what they mean. Time to pull out the dictionary to see what sessile meant. I already knew perfoliata. “Sessile” means the leaf is directly connected to the stem without a little stem of its own. “Perfoliata” means the stem runs through the leaf, making it appear to be perforated by the stem. Now that I had these meanings to go on, I couldn’t remember whether the leaves were attached or whether the stem ran through. So I had to go take a look. They weren’t right outside the back door so that meant taking the 4-wheeler and the camera and heading back down the driveway. Sessile Bellwort (Uvularia sessilifolia). This is a smaller and more dainty variety than the yellow Large-flower Bellwort I usually see. Turns out it is Sessile. I had hoped it was U. perfoliata, because that one is endangered and rare to find. But this one is beautiful, too. One of the common names for it is “Fairy Bells”, which I like. 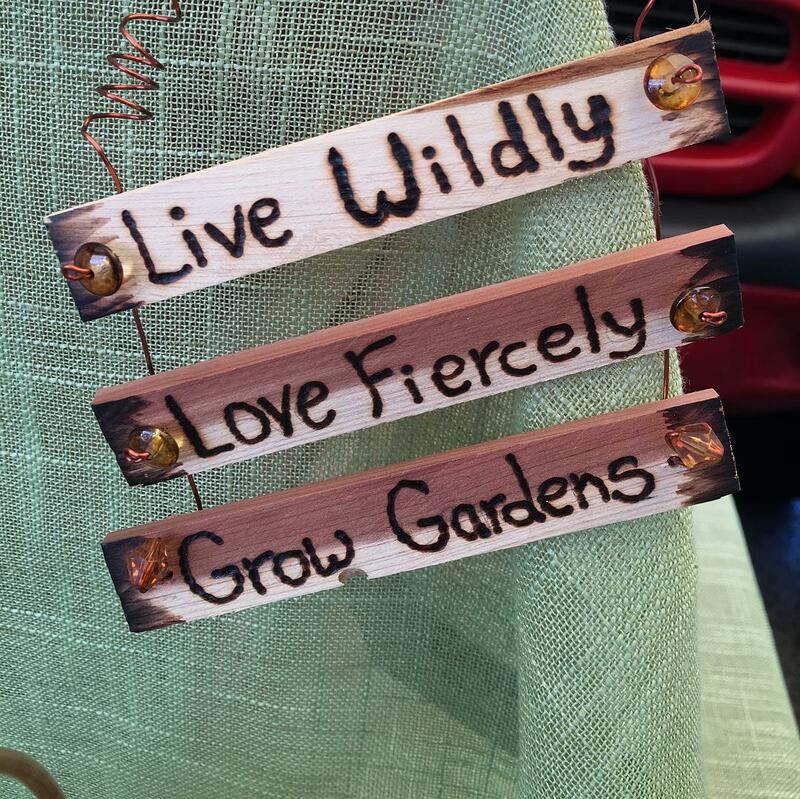 I may have a few of these at market, but they might be finished blooming by then. It’s early February and the plants in the ginseng habitat are still buried beneath leaf litter and possibly snow. We’ve had a very mild winter so far this year. I won’t be surprised if I find hungry ticks waiting in ambush today. 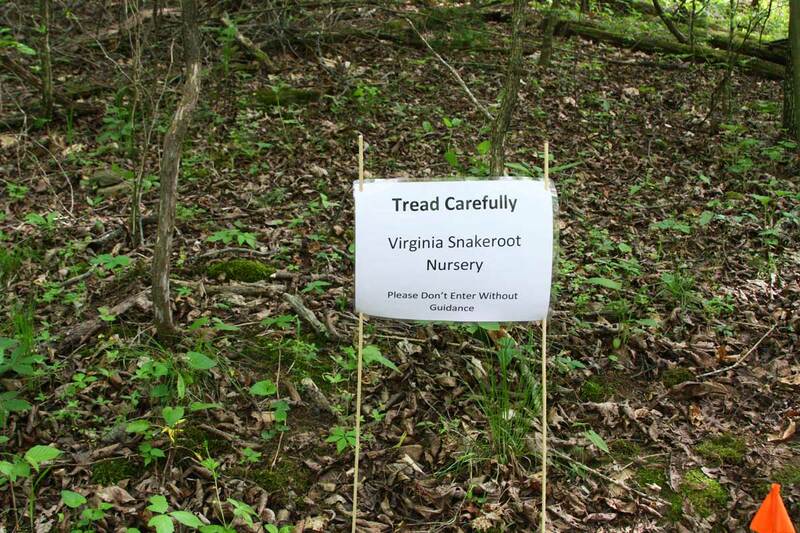 I’m going out to the mountain to find goldenseal so I can get some root divisions before the spring growth begins. I’ll take pictures and possibly make a short video and post it to this website later on. When it’s ready, there’ll be a link here for you. I’ll try to get pictures of all the plants as we propagate them throughout the year at the appropriate times and in the various methods. Right now and until spring for some of the plants, it is time for root divisions. Before these plants went to bed for the long winter’s sleep, buds were already in place and waiting to rise come spring. Bloodroot, goldenseal, ginseng, cohosh all have a new bud waiting for the growing season to begin. All but ginseng will sometimes have more than one bud per root clump. Bloodroot and goldenseal in particular are easy to divide and propagate because the rhizome root can be divided everywhere there are roots coming off of it and each section will make a new plant even if there’s no bud at that spot. Here’s a picture that shows what the bloodroot bud looks like. You can click on the image to make it bigger. Be sure to sign up for our nursery brochure if you’d like a plant list mailed to you in spring or just want an idea of what we’ll have at our booth at the farmer’s market in Huntsville. Devil’s Walking Stick. Strawberry Wahoo. Green Dragon. Jack-in-the-Pulpit. Fire-Pokers… All plants with strange names. Sometimes my friends and family think I make these names up. I remember coming home one day after running errands in town. I always drive really slow on the dirt road leading to Wild Ozark, and not just because the road is rough. The reason that motivates me to go slow most of all is so I can look on the sides of the road for interesting plants. Anyway, my mom was with me on one of these days and by the time I realized what I’d seen, we’d overshot the spot by a good distance. I shouted “Strawberry Wahoo!” and put the car in reverse. Poor mom probably thought I’d lost my mind. “No, really,” I protested. “It’s really what it’s called.” My name for it combines a couple of the common names into one, but technically I think “strawberry bush” and “wahoo” work better together so we know exactly which plant I’m talking about. Euonymus atropurpurea is likely considered a more specific name, though, I admit. But I think I’d have sounded just as mad shouting that out as anything else. Similar words were exchanged when my husband and I passed what I’d mistakenly said were “Red Hot Pokers”. Actually, that’s a different flower than the one I saw, but “Fire Pinks“, which is what these were is just as odd a name because these flowers are nowhere near pink. They’re definitely red. Then there’s the Devil’s Walking Stick. I spotted that one one day on our way off to somewhere once, and it too brought the raised eyebrows of “I think you made that name up”. I really like the Devil’s Walking Stick a lot because it’s one of the ginseng cousins, belonging to the Aralia family along with American ginseng, American Spikenard, and Sarsaparilla too. The only thing in common with any of these, though, is the way the flowers are arranged in a loose, airy, ball on the end of each flowering stem. All of the plants of this family flower in the same arrangement. The Devil’s Walking Stick I found looks more like a small, skinny tree than a shrub. Later in the year after the stem started sagging, I was able to pull it down so I could collect the seeds. I’m not sure whether I’ll be able to sprout and grow the seeds of either the Devil’s Walking Stick or the Strawberry Wahoo, but if I can, I’ll have these to offer at the market too. So you can have some plants with strange names too. Both of these are native to the Ozarks and interesting conversation specimens even if you don’t find the medicinal uses of them interesting. I have some American Spikenard, Jack-in-the-Pulpit and Green Dragon seeds I’m hoping will germinate in spring, too. What are your favorite plants with strange names? Yesterday I posted a handy image for those of you trying to tell the difference between wild strawberry and first year ginseng. I keep forgetting that when I post a new page to this website, post subscribers don’t see it. So here’s the link to it. Please pin this photo to your Pinterest boards and share it to your favorite social medias. Just since posting it last night there’s been nearly 30 +1’s and a few reshares through Google +. Speaking of Google+, I’m waiting on the postcard with our verification code to arrive. Once it gets here, if all works the way it’s supposed to, we’ll have a Local Business Listing on Google that won’t divulge our home address. Since we don’t have a public place of business, this page will list the hours and days we’ll be at the farmer’s market in Huntsville this spring. As we begin to go to craft shows and other festivals, I’ll post those dates and locations there too. Your reviews will help us get better ranking with Google. Since we haven’t set up shop anywhere in real-life yet, we haven’t had any personal interaction or sales encounters to give us the opportunity to ask for reviews. But many of you have shopped online with us! So if you’ve ordered anything from our website and was happy with your experience, please head over to our page and give us a few stars or a review! We don’t have any at all yet… and I’m not exactly sure how to leave a review myself, lol, so if you have any clues please comment below and let me know. Of course, if you were unhappy with your experience shopping with us, I’d sure like a chance to make it better. Please email me and I’ll get to work on that right away. Also, Dennis Lindberg from Ozark Mountain Ginseng sent a newsletter out to say he still has seeds and some rootlets available if you didn’t get yours ordered earlier. Our seeds are still in the refrigerator (what’s left of them) and they haven’t started sprouting yet. I’m planning to pot some more up for the market on the next warm spell. Soon they will, and you can still plant them but you have to be careful not to break off the tiny little root sprouts when you do. If you break it, the seed will die.